Dalí hardly needed the defense of his morals or his paintings, nor might he have wanted it. That was the wrong sort of attention. But maybe he himself was surprised by a later career turn as an illustrator of respectable “Great Books”—including not only Judeo-Christian scripture, but also Don Quixote, Macbeth, The Divine Comedy, Alice in Wonderland, and much more. The artist who seemed to have nothing but contempt for traditional canons approached these projects with the skill and professionalism Orwell couldn’t help but admire, as well as subtleties and understated tonal shifts we might not have associated with his work. These are not his first religious subjects; he had always referenced big scenes and broad themes in Catholicism. But the illustrations represent a deeper engagement with the primary text—105 paintings in all, each based on select passages from the Latin Vulgate Bible. Published by Rizzoli in 1969, Biblia Sacra (The Sacred Bible) was commissioned by Dalí’s friend, Dr. Guiseppe Albareto, a devout Catholic whose intention “for this massive undertaking,” writes the Lockport St. Gallery, “was to bring the artist back to his religious roots.” Whatever effect that might have had, Dalí approaches the project with the same diligence evident in his other illustrations—he takes artistic risks while making a sincere effort to stay close to the spirit of the text. If he did this work for the money, he earned it. 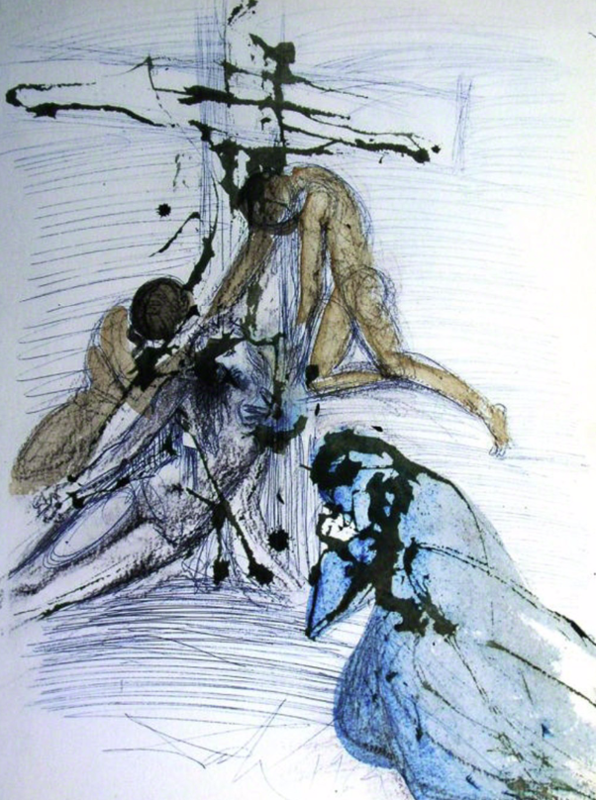 Dalí's illustrations “aren’t some kind of subversive prank," writes Arn. 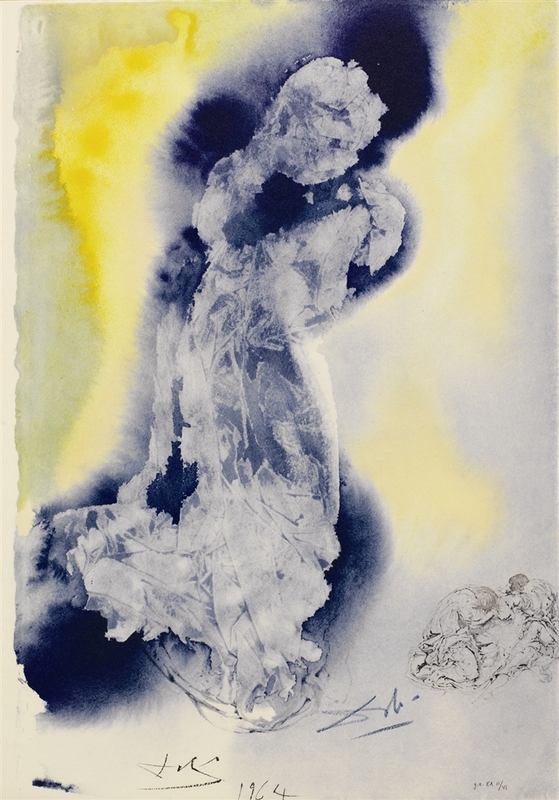 "The luminous watercolors he produced for the Bible are, in the main, earnest renderings of their sacred subjects.” Perhaps the book illustrations have attracted so little attention from art historians because they lack the sensationalism and outrage Dalí aggressively cultivated in his public persona. 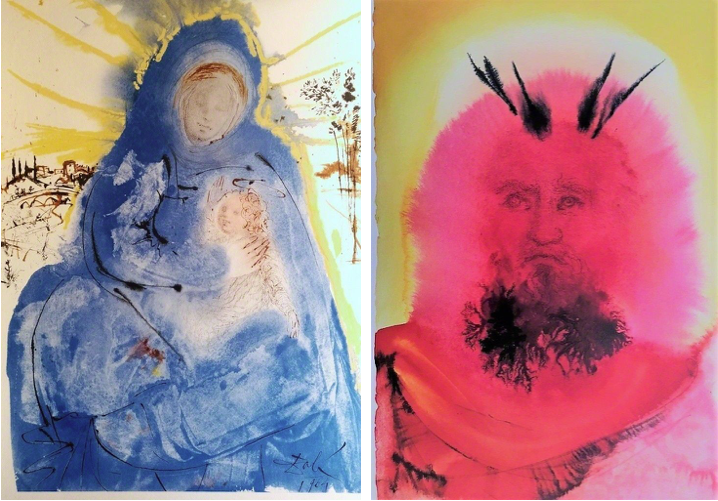 Maybe these paintings, as German gallerist Holger Kempkens puts it, show “something of a spiritual side of Dalí.” Or maybe they just add to a bigger picture that shows what he could do with narratives not of his own making, but which he clearly respected and found challenging and stimulating. These qualities apply to many parts of the Bible as well as to great literary epics, including those based on the Bible, like John Milton’s Paradise Lost, which Dalí illustrated in a series of surprisingly spare, elegant etchings. You can buy an original set of Dalí’s illustrated Bible in five volumes from The Lockport Street Gallery (email for a price and condition report); buy a more affordable book online that features and explores Dalí's illustrations; or see all 105 of Dalí’s Biblical illustrations (and purchase some 1967 prints) at Artsy. 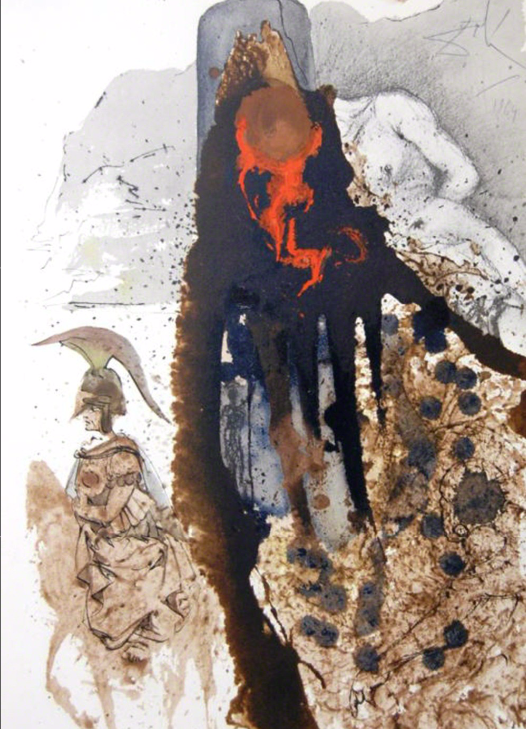 Salvador Dalí’s Illustrations for The Bible (1963) is a post from: Open Culture. Follow us on Facebook, Twitter, and Google Plus, or get our Daily Email. And don't miss our big collections of Free Online Courses, Free Online Movies, Free eBooks, Free Audio Books, Free Foreign Language Lessons, and MOOCs.